Enriched with Natural Scalding Serum of Natural Oils: Borage Seed Oil, Jojoba Seed Oil, Calendula Flower Oil, Olive Fruit Oil, Basil Leaf Extract, Palm Oil. Traditional method of preparing our natural blend and our unique creates a unique mineral-based compounds which deep clean, replenish and revitalize your skin, restoring its natural suppleness and moisture level. STYLE AROMATHERAPY unique mud soap gently removes dirt and dead skin cells while leaving the skin clean, soft supple and radiant. Reduces sebum secretion, purifies the pores and re-stimulation of oxygen supply to the skin. Based on powerful natural ingredients, our unique formula is a natural skin care treatment for skin problems such as oily skin, acne and psoriasis. Enriched with Natural Scalding Serum of Natural Oils: Argan Oil, Borage Seed Oil, Jojoba Seed Oil, Calendula Flower Oil, Olive Fruit Oil, Basil Leaf Extract, Palm Oil. Based on traditional recipe of authentic Moroccan Berber women Argan oil, that has been passed from mothers to daughters down the centuries. 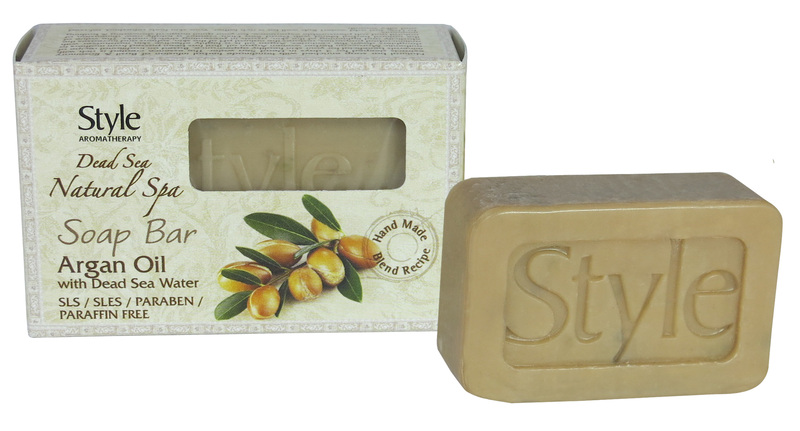 Argan oil is a highly effective skin moisturizer with antimicrobial properties. Restores the natural pH level of the skin, softens and increases the elasticity and tightening of the skin, assists in preventing stretch marks. The value of the natural herbal blend with Dead Sea Elixir creates a totally new dimension of natural and soft pleasurable experience for your quiet magical showering and bathing moments.